Just got out of a chat with an agent about speed issues I've been having for the past month and he confirmed with me that due to exceeding the data usage cap that Cox is indeed shaping/throttling my connection. I tried to point out that under Cox's own Terms of Service it states that "Cox does not shape or throttle Internet traffic based on the particular online content, protocols or applications a customer uses" but he was adamant that I was being throttled due to excessive usage. I had a feeling that was the case since my speeds have taken quite a nose dive in the past month. I'm currently on the Internet Premier plan that reportedly has 100mbps/10mbps and I'm down to 16.2mbps/768kbps on my last speed test. The download doesn't bother me so much, but the upload is killing me. I've done some troubleshooting on my end just to make sure it wasn't Cox doing this to me. I've moved the modem to every possible spot in the home, tried the connection with and without the router (same results either way), did a factory reset on my modem (Motorola Surfboard 6121), and checked my signal ratings and they appear to be in a good range for both the downstream and upstream. I feel like I've covered all my bases, and the timing of my slow down with me going over my data usage really only points to shaping happening on Cox's end. I'd love to be proven wrong, but that's what it looks like to me. I'll probably be calling in the morning to cancel service. tl;dr: Asked agent if I was being throttled, said yes even though it's not Cox's policy to do so. Don't waste your time with support. They won't do sh*t except schedule a tech to come out, then they never show up. I've been having the same issues for over 3 weeks now. Every night starting around 4:30-5:00 my internet slows down to nothing. Here's my last speed test and it's like this every night. I'm just collecting evidence to file small claims against them. It's obvious they have screwed something up in the past month and aren't trying to help customers out. The question I would have asked is "how" and then see them stammer. Sounds like a scare tactic to get you to upgrade tiers. If it was throttling, wouldn't the speed be reset to normal every month when your bandwidth cap is reset? That's not entirely true. It would make SENSE to throttle only during the period when you've gone over your data cap and then restore it to normal on the beginning of your new cycle, but that doesn't always happen. I've worked with a couple of ISPs (not going to name any names) with throttling policies and it was pretty normal for customers speed to be throttled even after the cycle of excessive usage. I think that was due to unsophisticated software. But anyway, I did ask him how that was possible when it's not written in Cox's policy and he quoted a portion of the policy which stated "If your data usage exceeds the amount included in your Internet package, Cox may suspend the Service or require you to upgrade the Service to a higher package and/or pay additional fees" to which I retorted suspension and throttling are two completely different things. I decided to leave it there because he pretty much already gave me the answer to my question and there was point in nitpicking the policy quote. My speeds look like they've normalized for now (I started my new cycle about a week ago), they'll most likely drop down later today though. My main concern isn't the fact that I'm being throttled but that Cox's written policies don't seem to coincide with applied practices. If it was in the policy from the start then I would have accepted it and moved on, and wouldn't have gone through hours of troubleshooting my connection. 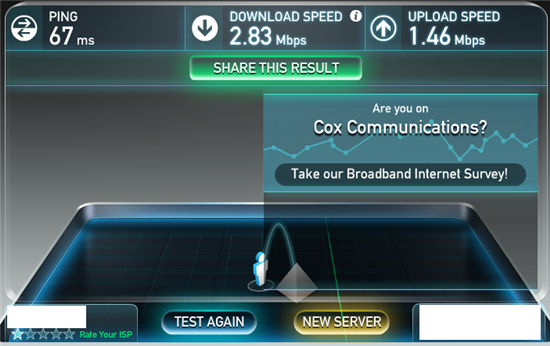 It would be nice if a moderator could give their opinion on what Cox's stance on throttling is. Did you happen to get any names? Can a moderator confirm?